There is nothing like a body creme that makes you feel fresh, smooth, and clean. There are some great body cremes out there, but today we are featuring an extra special one. When we (Kiss and Wink) think of butter milk, we think of smooth, creamy and soft. 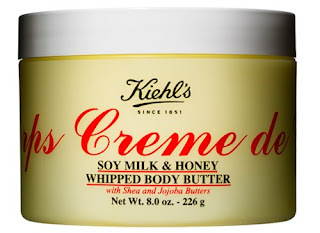 This body creme will make you think that you just poured amazingly scented butter milk all over your body. We hope that you are moisturizing your entire body when you get out of the shower and every time it is dry. Moisturizing will prevent wrinkles and will make your skin feel brand new. We call this body creme dessert in a jar. We love dessert, but we can’t always eat it so this is the next best thing. We are going to tell you all about Kiehl’s Creme de Corps Soy Milk & Honey Whipped Body Butter. Fast absorbing, will hydrate and protect skin from flaking. The scent is so amazing people everywhere will wonder what you are wearing. Shop online at Kiehls.com or locate at Nordstrom and BergdorfGoodman. Never leave home without properly moisturizing your skin. No one wants to accidentally brush you as they are passing and experience a scratch from rough, dry, flaky skin. This product is an investment worth while. We give this product 2Kisses and Wink. Its so amazing it also deserves a Smooch.